Geography Time! Cider is like a wine: the terroir, temperature, and the apples themselves create a unique, regional profile. This makes the many ciders of the world unique because you aren’t simply drinking fermented apple juice, but you’re drinking a local tradition that captures a particular moment in time. Ok, no more poetic language, let’s get to the brass tax. Regional footprint is hugely important for creating a unique flavor profile of cider. If you’re completely new to cider you might want to first check out our article on The Down and Dirty Truth About Cider. For those who are familar with cider but maybe get a little intimidated when trying to figure out which one to drink, knowing a cider’s country of origin and even its sub-region along with the regional characteristics will help you pick your cider of choice. Best. Geography Lesson. Ever. France is the world’s largest producer of cider, or cidre. Normandy and Brittany in northern France are the main producing regions, which have been producing the beverage since the sixth century. Until World War II, cider was the second most consumed beverage in the country but the war destroyed a majority of the apple trees and stifled production. French cider is ….well….so French (mais oui!) because the country has strict regulations on its production, resulting in a fairly predictable flavor profile. Cider makers must use specific apples designated for cider production and can only use up to 50% of the total volume of juice to come from apple concentrate. Ciders with a label that includes “Appellation D’Origine Contrôlée” (AOC) or “Appellation D’Origine Protégée” (AOP), tells you the producer makes cider according to these strict regulations, so you know it’s legit. 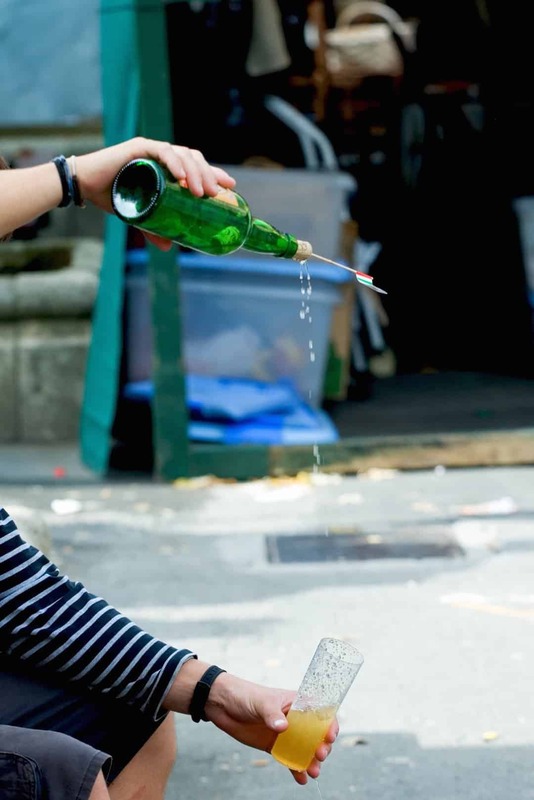 French cider reflects the culture: it’s light, a little sweet, and is always looking for an excuse to throw something into a champagne bottle. Who doesn’t love that?! In general, there are two types of cider: brut, a dry, crisp beverage that contains 4.5% alcohol; and, doux, a slightly sweeter variety of about 3% alcohol. French ciders offer lower alcohol levels, with naturally sweet and naturally carbonated attributes. French cider makers use the tradition of keeving, a technique that removes nutrients from the juice which slows the fermentation process. This process produces a much sweeter, fruitier drink. It also lowers the alcohol content because less of the natural sugars are converted. In fact, it is not rare to find a Cidre Bouché, a brut-style cider, at or around the 2% alcohol by volume. So if you are in the mood for a sweet, slightly carbonated taste of France, French cider may be right for you. Spanish cider, sidra, is a more vinegary, tart party for your mouth. At my local liquor store, there is always a few bottles of Spanish cider. When I ask the shopkeeper about the ciders, he’ll point to the beverage and say, “you have to be in a mood for that” or “it’s super funky.” Let me explain why he says this to me. At first sip, many people may think they’re drinking bad batch of cider. HOWEVER, this is the typical profile of Spanish cider. Ciders from this country are distinctly dry, tart, slightly vinegary and with a greenish-yellow, cloudy appearance because they are unfiltered. Once you get beyond the initial jolt of tart, the beverage reveals aromas and a flavor profile that makes you think of Spain: a combination of earthiness, spice, and citrus. Spanish cider is mainly produced in the Asturias and the Basque regions in northern Spain. Both regions are famous for their traditional-style cider called Sidra Natural in Asturias and Sagardoa in Basque country. Cider makers press apples and then use a slow fermentation process with wild yeast in chestnut kegs. Like France, there are regulations concerning production– for example, growers can only use authorized apple varieties in order to label their beverage Asturian sidra or the Eusko Label for Basque cider. They are generally still, or uncarbonated, and have approximately 5-6.5% alcohol by volume. Even though the two regions are close, there are some differences between ciders from the two regions. For one thing, Asturian region makes wayyyyy more cider than Basque country. The region is responsible for nearly 80% of all Spanish cider production. The flavor profiles are slightly different as well. Asturian ciders tend to be fruiter than their Basque counterparts, so if you want a more approachable yet still funky cider, looking for cider from this region may be your jam. Basque cider is less sweet, more tannic and acidic, and even has some savory, barnyard qualities, which is incredibly nice for pairing with meat. The key difference is the tradition of how the Asturian and Basque aerate their cider. 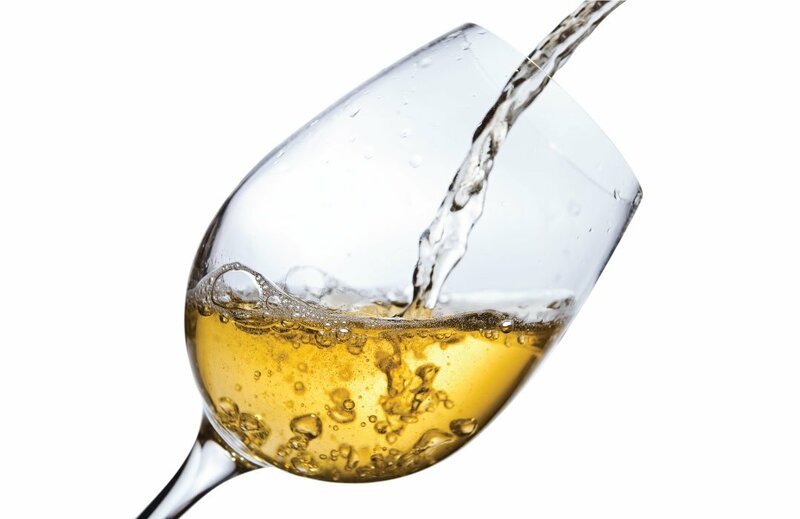 Both methods are sometimes called “throwing the cider,” which adds air bubbles, to the otherwise mostly still cider, that give a brief Champagne-like carbonation. In Asturias, cider is poured in very small quantities from a height into a wide glass. Typically bartenders will hold, in one hand extended upwards as high as he can reach, the bottle and in the other hand hold the glass downward as low as he can. This sounds like a yoga position I will happily try. Meanwhile, cider enthusiasts flock to Sagardotegia (Basque for cider houses). The cider comes from giant wooden casks, which are opened when someone yells “Txotx!” The cider shoots out of the tap and must be caught several meters away and as close to the ground as possible. Disclaimer: if you scream “Txotx” in a bar, The Crafty Cask claims no responsibility if random people start opening barrels in hopes of throwing cider, resulting in utter chaos. The Crafty Cask does hope you videotape the fiasco and send it our way, however. If you have a funkier palate and feel like pouring cider over long distances, Spanish cider may be just what you’re looking for! The United Kingdom drinks more cider per capita than any other country in the world. What’s more, 57% of all apples grown in the U.K. are for cider production. Talk about dedication. Production ranges from the small producers where you can only find the cider in a local pub or the mass-produced brands found worldwide. U.K. ciders typically rely on fresh apples but sometimes use concentrated apple juice. There are two traditions of cider production in the U.K., which create very different results. Different strokes for different folks, right? The West Country cider includes places like Somerset or Devon. The West Country tradition uses locally grown cider apples called bittersweet and bittersharp. You may see the phrase “scrumpy” on some labels, which refers to farmhouse ciders from this region known for using only apples and not apple concentrate. The result is a cider that’s like a Brit’s sense of humor: bone dry. Some even say this cloudy beverage is so dry that it doesn’t even taste like apples. Cider from this area is uncarbonated, unfiltered, very tannic, and high in alcohol (at least 6%). East Anglia and Kent regions are the other large areas of cider production. Cider makers in this region use sweeter apples, sometimes apples that are edible to eat unlike most cider apples. They sometimes add other fruit to their concoctions. The result is a lighter, sweeter, and fruit-forward appearance, a stark contrast to the West Country. Ciders from here are high in alcohol up to 7.5%, but local cider not shipped to the U.S. can be as high as 8.5% because they aren’t subject to tax/import regulations. But, that’s another story for another day…. Thanks to the British, American cider was historically a trendy beverage. English settlers brought over cider on the Mayflower (literally) and it was a safer alternative to water. Cider fell out of favor and beer rose in popularity. Why? Fun fact: Prohibition and the Volstead Act banned the production of alcoholic beverages including cider. However, cider production never recovered post-Prohibition because people vested in the Temperance movement who heard about illegal cider production would burn orchards. While bars could become restaurants and serve non-alcoholic drinks to stay afloat, cider producers never recovered. Particularly since most of the old cider apple orchards were re-planted with snacking or cooking apple varieties. Prior to the recent craft cider boom, most U.S. ciders being made again after prohibition were pretty sweet and made from apple juice concentrate. Now that cider is gaining in popularity, we’re seeing more cider innovation than any other region you’ve read in your Geography lesson for today. Go ‘Merica! The reason for innovative ciders is the lack of regulations that would make cider “uniquely” American. 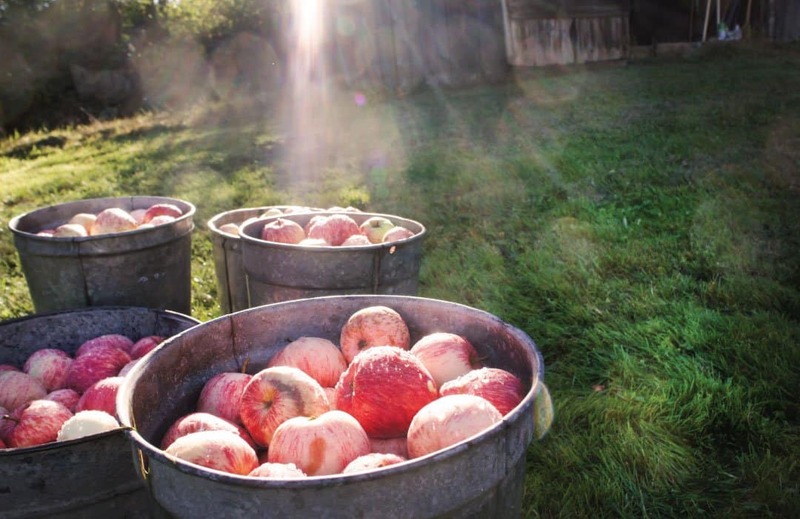 Unlike European countries with its stricter production regulations on the types of apples or sugar content, American cider makers have creative freedom to blend old-world tradition with new methods, producing an eclectic variety of ciders. The top American ciders hail from New England, Oregon, and more recently Michigan. These are all places where…not surprising….there are a lot of apples and by extension lots of predictably curated photos of people wearing sweaters and apple picking on Instagram. The range of ciders is vast but craft producers are focusing on locally grown apples to capture the regional footprint through its libation. Some cider producers will add sophistication by blending apples from various local areas, while others keep it simple. From the barrel-aging and fruit infusion techniques of Michigan, to a regional blend of Washington apples aged in stainless steel vats, to hopping ciders similar to the way IPA beers are made, U.S. producers are breaking the mold of production and our palates. Ciders range in sweetness and alcohol content where the latter can be anywhere from 3 to over 11 percent. Yes, that’s a lot higher than our European counterparts…what can we say, American’s like to get a good buzz on! So basically I just said, the U.S. has a massive variety. How do you figure out what cider you want to drink tonight, though? Using the vocabulary from other regions — dry versus sweet, still versus carbonated, or funky versus crisp and clean – you’ll be able to navigate what cider producers create a cider based on your unique preferences. Yes, even in America can you find a funky, unfiltered, and dry cider! To put this in perspective, you won’t be able to do this as easily, or possibly at all, in other countries because the adherence to a strict tradition and consistent flavor profile. 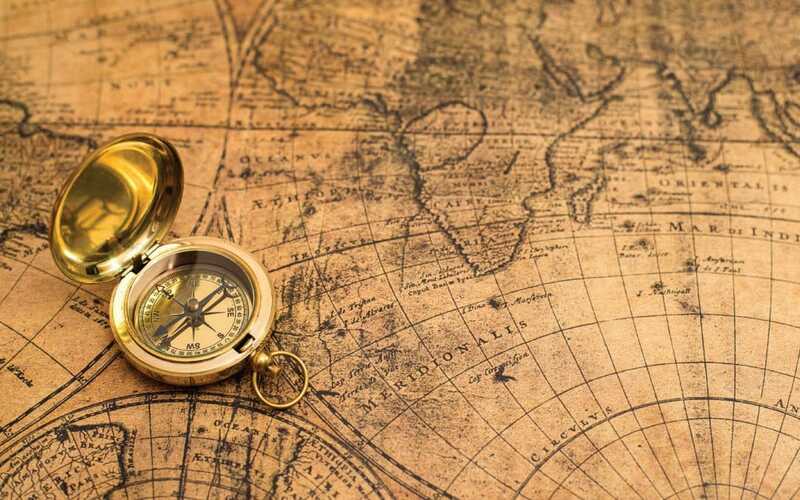 It’s almost like you can travel the world through cider without ever leaving…although we highly suggesting actually traveling the world through cider as well! Ok. We’ve been around the world from behind our computers and learned not only about the different kinds of ciders, but how much location matters. But now it’s time to get outside and start drinking! Going to your local cider house, bottle shop, or bar and trying new things can be a great way to apply what you learned from our little introductory lesson. When you do that, I encourage you to ask about the cider, where it’s made, and the story behind the producer. That’s where the fun and discovery of your own palette begins. As you do this, make sure to tell us what you’re finding and keep the cider conversation going…by either commenting below or tagging us on Instagram or Facebook as you share your discoveries with the world!